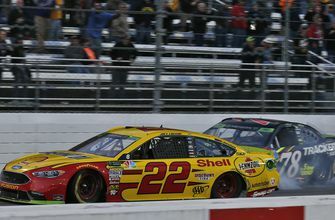 CHARLOTTE, N.C. (AP) — Maybe Martin Truex Jr. is the driver to root for through the rest of the NASCAR playoffs after his last-lap loss to Joey Logano at Martinsville Speedway. His generation of jet-setting, lakefront-living, well-compensated stars has not been all that relatable to the average fan, a problem for NASCAR as it tries to energize its aging audience. Truex, the reigning Cup Series champion, is typically mild-mannered and unemotional, despite a handful of outbursts the past few months. Then came Sunday at Martinsville, where Truex was furious that Logano had used a bump-and-run to get past him for the victory. Truex had raced Logano clean over the final 10 laps to complete his pass for the lead without putting a scratch on Logano’s car. Logano didn’t show similar respect and used his car to shove Truex out of his way. The move denied Truex a victory that would have guaranteed a spot in the final race where he could defend his championship. It also denied him his first career victory at a short track, and a chance to celebrate once again with his Furniture Row Racing team before it closes for good. Truex vowed not to allow Logano to win the title and promised that he would be collecting his second consecutive Cup trophy. It was a feisty version of Truex, a driver who has been dealt numerous setbacks at nearly every career turn. In 2009, when Dale Earnhardt Inc. merged into Chip Ganassi Racing, Truex, a two-time Xfinity champion, no longer recognized his own team. He gave it two years before moving to Michael Waltrip Racing for a strong three seasons. That fell apart in spectacular fashion when he and his team were innocent benefactors in an organizational cheating scandal to get Truex into the playoffs. He had nothing to do with the incident, but it cost his team a sponsor. Then the team folded, Truex needed to find another job, and he landed at Furniture Row, the oddball team based in suburban Denver. When he finally bucked conventional wisdom and won a Cup title, his coronation was abruptly halted when his sponsor said it was leaving. And, just as Truex had learned with nearly every team in his career, when the sponsor goes the team doesn’t typically survive. Furniture Row Racing won’t exist in a month. Barney Visser is shutting it down because he doesn’t want to continue funding the single-car team without corporate funding. To remain in NASCAR, Furniture Row employees need to find new jobs, almost all of which are located in North Carolina. Truex and crew chief Cole Pearn are expected to stay with Toyota and move to Joe Gibbs Racing. Truex, win or lose this championship, is going to land on his feet. For nearly 10 years, Truex has kept his mouth shut more times than should reasonably be expected. Yet his frustration has slowly simmered as his days with Furniture Row wind down. He thought he had a car capable of getting him his first short track victory back in August at Bristol, but he was wrecked and angrily kicked his damaged vehicle. Truex seethed after Jimmie Johnson spun him racing for the win at Charlotte. A week later in Dover, Truex was racing for a top-five finish when he was collected in an accident with four laps remaining. He was in an accident in overtime at Talladega a week after that. Then came Martinsville, where Truex finally had enough. Next up is this weekend’s race at Texas Motor Speedway, where Truex has never won but was second last fall. A tire problem caused him to finish last at Texas earlier this season. Truex goes into Sunday’s race 25 points above the cutline, tied with Kevin Harvick for third in the playoff standings with three spots in Miami still up for grabs. Those slots were assumed to go to “The Big 3” or Truex, Harvick and Kyle Busch, the trio that dominated the regular season. That is no longer a given, and Truex could be the odd man out.